Each player is repeatedly putting the other in check. Even simpler. Each player is creating check every other move. Which one is the "offensive" one? Since this is unclear, the situation would have to be declared a draw. Under my suggested rule #3 (if either player makes the same checking move three times in a row, that player immediately loses the game), then whichever player had created check first, would lose. 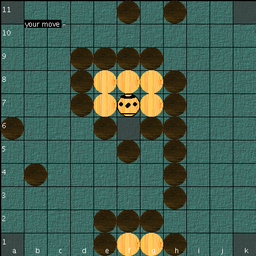 crust wrote: Under my suggested rule #3 (if either player makes the same checking move three times in a row, that player immediately loses the game), then whichever player had created check first, would lose. I like crusts suggestion for a perpetual checking rule that allows for black to be the offender. I doubt any situations exist where one cannot definitely say who is the cause of a perpetual checking situation. Thanks to crust for presenting another image of a black forced perpetual check. Such situations especially one where white cannot simply walk away, seem exceptionally unlikely in a real game, though admittedly possible, and as such our rules should take the possibility into account. Clearly white has many options in this exact set up, and a good white player would no doubt win, but if we remove all his other men, the situation becomes rather more hopeless. A perpetual check rule should be able to handle this situation in both cases. And if mate in two doesn't count as check, then here white can force black to lose, by making black put white into perpetual check. At which point the universe implodes. Adam wrote: And with the addition that any repeat move that involves a checking move may not be repeated more than 3 times, at which point the checking player must make a different move. Hagbard wrote: In all these cases, one of the parties ("the attacking party") is trying to accomplish something which turns out not to be possible, because the opponent is able to prevent it. So the "attacker" must accept that his attack cannot succeed and must stop his perpetual moves. MaC wrote: I learned 20 years ago, the king have to escape otherwise he is starving to death during the rampart. crust wrote: The only problem I can think of is if the two players don't agree which one of them is the "offensive" player. I suppose in that case they would have to agree on a draw anyway, but then we're back where we started with draw-by-repetition. In cases where check is involved, the offensive player is easy to identify, so possibly this rule should apply to perpetual check only. That still leaves us with the possibility of draw-by-repetition where check is not involved, but if check is not involved, neither player is compelled as strongly to repeat the moves, and each one can make his own value judgement of whether they offer or accept a draw, or make an alternative move. Alternative statement of rule #3: Neither player may make the same checking move three times in a row. crust wrote: Each player is creating check every other move. Which one is the "offensive" one? Adam wrote: And if mate in two doesn't count as check, then here white can force black to lose, by making black put white into perpetual check. At which point the universe implodes. The discussion reveals that the perpetual check is a complicated matter, and crust and Adam found very inventive borderline cases! As mentioned, perpetual check is a draw in chess. A rule could require that "the attacker" breaks the deadlock, but it has been pointed out that it's not always simple to determine, who exactly is the "attacker". What if fx. white wants to move a piece strategically closer to a corner and black blocks because it's a very dangerous move. Nothing particularly is "attacked", so if the two parties do perpetual moves as a result, is it a draw then? If so, white achieves either a draw or else a move highly unfavourable to black, all at the expense of black. The simplest rule would be to still let all perpetual moves be a draw (or to convert all perpetual move draws into black wins). Another solution could be a generalized rule which integrates most of the proposals from this discussion. Adam's example shows that the side stepping may also include a full row and not only two squares. The generalized rule could be, that in all cases the party who did the move in point 1 must do no more than 4 side steps, after which he must break the deadlock (i.e. when the point 1 position is repeated 3rd time). Even when using squares from a full row the way it's done in Adam's example, it's counted as side steppings. is very rare. The perpetual checking king is protected to one side by a barrier of whites and can take breaks in the side stepping. Normally the stepping party must continue the "attack" or the whole situation will alter. Anyway, with a perpetual move rule the position in the example is to no advantage for white. - I can imagine that such a rule could've been in function even in the Iron- and Viking Ages. Not so formally expressed, but the players would intuitively know, who is the "attacker" and who must break the lock. And if they couldn't reach an agreement on the matter, they'd finish the game in a direct, physical fight instead. What if white managed to occupy a corner, then black tries to take it back, and white must side step to keep the corner. It wouldn't be fair to turn white's proper defense of the corner into a black win and thus force white to do some other move and let black in. Last edited by Hagbard on Fri Mar 24, 2017 8:34 am, edited 4 times in total. On the perpetual moves rule, I personally find that it would be a lot easier to call all of them a draw. I draw this simple conclusion off two things. The first is that the situation is so rare. Generally, it is unsatisfactory because both players have not had the power to control a certain area of the board, and thus it would probably be fair to make it a draw. Often, though, it can mean that White has pulled some significant leverage over Black (or rarely the other way around), and that they could find another move that might bring them the win, which they would prefer over a draw. This is very general, but my second reason is that it is too messy. If we implement a variation of this rule, it would be hard to describe the rule to a begginer; finding the 'attacker', the difference between perpetual check and perpetual movement and Adam's tricky example as well. The rule is just too messy. We needed to fix the problem of early draws, but it's not like one player can force a perpetual move, going into the game planning that, because, as already said, the need for it just arises out of a certain position. If you look at the rules of chess for a draw, you will find a few simple lines, and I would rather not get a page worth of rules for a draw in Hnefatafl! This is just my opinion. Evans: I think that the discussion above makes it clear the motivation for the proposed rules. In corner Talf perhaps you are right that perpetual threats are rare, but when playing to the edge it is quite common for such opportunities to arise, and there needs to be some rule to handle it. Also, I think you are to "infected" by the modern chess rules, look at the rules for Xiangqi and Shogi (Chinese and Japanese chess). They both have rules for breaking perpetual threat situations quite similar to the proposed rules above. Sorry conanlibrarian! Yes, I think in edge Tafl it is certainly needed for a rule forbidding perpetual check. The most convincing argument (and again the simplest) is probably that if a perpetual checking move is repeated, then the offensive side must find an alternate move, and that perpetual moves (distinguished from perpetual checks) should be ruled a draw (and all other curious situations,which have, I think, probably been fully defined). Thanks for telling me about the Eastern chess variations and their rulings on the perpetual checking and moving, though again I find it a little confusing from first look, and, personally, I would rather not have condition upon condition in the rule book. If we do find a rule though that is able to be clean and best for both corner Tafl and edge Tafl as well, then I would not complain! But my suggestion was more for corner Tafl. This draw fort is easy to do against the computer; just move two white pieces to the edge, keep the rest in center and arrange them as a fort. White can go for the draw from start, so this could be another source of abuse. A draw fort something like this is also fairly easy to do; move the king to the edge and arrange rest of the white pieces as a fort in center. - a fort is only a draw fort if the white pieces in the fort are in contact with the edge, the king is part of the fort, the king or some white piece in the fort can move, and the fort cannot be destroyed by black. - otherwise, if the king and all white pieces are completely surrounded by black pieces and edges, white has lost. In the end game, this situation could happen: both white and black lost 12 men, and left is the lone king and just enough blacks to block the corners. If the game ends as shown in the diagram, shouldn't this be a white win? The king did escape to the edge, can move and is not captured. Maybe he can be captured, but we'll never know, because black doesn't try, so the king is as safe as in a fort. If black should try to go after the king, the king would probably escape to a corner. If the king can move and cannot be kept away from the edge, when the game ends, white wins. Also, this prevents any sort of game avoidance. In start of the game, white must fight to escape, or else loose. 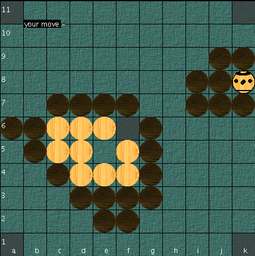 In end of the game, black must fight to capture the king, or else loose. Lots of good stuff in these new posts! Great that everyone is getting involved to hammer this out. Will respond when I have proper time! Evans, I myself went down the white leverage argument road when this thread started, and have come round to seeing that the draws in tafl games while rare, are rather like a fatal infectious disease in tournament situations, which leads to the game being white 'win' heavy (the stats dont show it, wins and losses being even, but as the draws are all forced by white, there is clearly an imbalance, which the copenhagen rules address, but probably only solve if perpetual manouvers are ruled out. How we achieve that remains to be seen, though i'd like to hear some of these asian game rules described here. The Ko rule in Go is another. Maybe the formulation is there already written? I think Hagbard is onto something, any given game situation is open to a regress of 'you started it' but in practice these repeat situations always (i think!) have a clear 'starter'. Its simple, the repeated move has a beginning move, the move before that is not part of the repeat pattern. So surely the aggressor is always going to be clear? Examples to the contrary welcome! Or would this be too drastic? I disagree though in the expansion of the rules for the last example. If White has enough pieces to build an edge fort, then he has a right to win, but if not then both players have fought out each other's winning chances, and thus deserves, I think, to be a fair draw. I think we should see if any of the two cases mentioned appear in the Copenhagen tournament. The side that perpetually checks with one piece or several pieces will be ruled to lose under any circumstances unless he or she stops the perpetual checking. The side that perpetually chases any one unprotected piece with one or more pieces will be ruled to lose under any circumstances unless he or she stops the perpetual chasing. Chases by generals and soldiers are allowed however. If one side perpetually checks and the other side perpetually chases, the perpetually checking side has to stop or be ruled to lose. 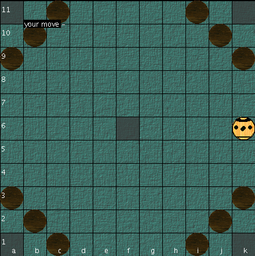 When neither side violates the rules and both persist in not making an alternate move, the game can be ruled as a draw. When both sides violate the same rule at the same time and both persist in not making an alternate move, the game can be ruled as a draw. Different sets of rules set different limits on what is considered "perpetual". For example, club xiangqi rules allow a player to check/chase six consecutive times using one piece, twelve times using two pieces, and eighteen times using three pieces before considering the check/chase a perpetual check/chase. The above rules to prevent perpetual checking and chasing are popular, but they are by no means the only rules. There are a large number of confusing end game situations. Again, to me these rules seem a bit messy, but quite fair, and they are going along the lines that everyone has suggested so far. For the purposes of Tafl, I suppose 'chasing' can be considered any non-checking repitition. It is my thought, though, that any moves that threaten to obtain mate INDEFINITELY for either player are considered 'checkings', so if White is skipping his King between the two 2nd Files but is being blocked by one black piece, or is threatening to come to an open Corner File (1st File) repetitively, then these can be considered as 'check' moves. Another note behind this logic is that in Tablut, 'tuichi' was considered to be checkmate, and was when the King was on any open file, and to first get to checkmate, you have to have a 'check', which is the threat to get to an open file, or in Corner Tafl, the threat to get a position where you can either get to a corner or a position to get to the corner. So these 'indirect corner challenges' can be considered 'checking'.I hope this, and the rules above, might be helpful.